When you shop for a vehicle like the 2014 Chrysler Town & Country, there’s a good chance you’re looking for it to serve your family, which means that price and the family budget are likely at the forefront of your mind. While many drivers go to the Chrysler minivan for its legacy, we think that you’re better off with the 2015 Honda Odyssey. To start with, the 2015 Honda Odyssey LX is priced to own at just $28,975 (MSRP)* compared to the 2014 Chrysler’s $30,765. But we hear you wondering whether the Town & Country doesn’t make up that price difference with features. It doesn’t. Let’s take a look at the features of both of these minivans and you’ll see where the true value lies. Don’t get us wrong, the Town & Country can be equipped with many comparable features, but you’d have to upgrade the Chrysler past its basic trim to get its features on par with the standard amenities of the already more affordable Odyssey. As if features weren’t enough, the Odyssey is more fuel efficient as well. Honda’s 2015 Odyssey LX with automatic transmission earns an EPA-estimated 28 mpg on the highway from its 3.5L 248-hp V6 engine. ** The Town & Country, on the other hand, only manages 25 highway mpg. This isn’t the first time the Odyssey has come out ahead of the Town & Country. 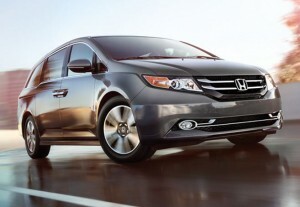 See how the 2014 models of both minivans compare. When you want a dependable family vehicle, all you need to do is visit a Central Illinois Honda Dealer near you. In addition to the 2015 Odyssey, we have the Honda CR-V, Pilot, and Accord—all of which make excellent additions to the family fleet. Take a test drive of one today!